2018 Ford Expedition - It's definitely an upgrade in style for Ford. 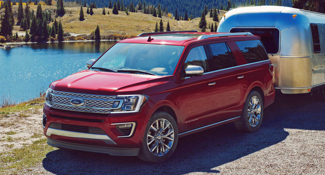 The 2018 Expedition has the cutting-edge tech, towing capacity, and space that demonstrates this competitive class of mega-haulers. Platinum versions have the most pzazz, with classier styling and countless standard features. The 4 wheel drive is a must in the snowy, wet, or muddy roads where I live. The 2018 Ford Expedition Platinum 4×4 comes with 20-inch wheels, parking sensors, roof rack rails, retractable running boards, heated second-row seats, a leather-wrapped steering wheel. The pro about this vehicle is the size. I had owned a Jeep Grand Cherokee before this and we needed more room for traveling. It also comes with second-row leather captain’s chairs, and a rear-seat entertainment system with dual headrest-mounted displays. Which is great for long trips with a toddler. Which we take quite often. About 6- 13 hours in a day. The top con on this vehicle is the sunroof which has leaked on us twice. It is actually still in the shop because they can not figure out how to reconnect it correctly. Other that that we love the vehicle.